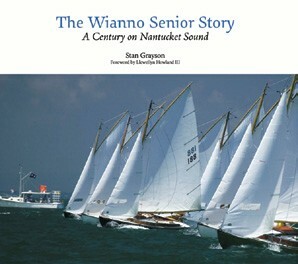 One of the most enduring one-designs in the United States, the Wianno Senior was commissioned by a group of sailors at the Wianno Yacht Club in Osterville, MA. Designed by Horace Manly Crosby, a member of the family that built the famous Crosby catboats, the first Wianno Senior was launched in 1914.With its shallow draft and centerboard, the 25-foot gaff-rigged sloop was well suited for the shallow waters and swift-flowing currents of Nantucket Sound, where it is raced enthusiastically to this day. This book, which would make a fine gift for anyone interested in beautiful boats, the history of small boat racing in America, or Cape Cod, is lavishly illustrated with archival images and the work of several of today’s best sailing photographers. Among the historical photos is one of a very notable Wianno Senior owner, John. F. Kennedy, whose Victura became known as the “first boat” when he became President in 1960. Stan Grayson is well known for his books and articles about American yachting history and the American marine engine and automobile industries. His work has appeared in Nautical Quarterly, Automobile Quarterly, and WoodenBoat, to name a few. His best-known books include Cape Cod Catboats and Ferrari: The Man, the Machines. He lives in Marblehead, MA.